Home Prices in Carlsbad and North County: What's Ahead? Home prices in Carlsbad and North County are expected to rise–and possibly increase your family’s fortunes. Our real estate licenses doesn’t come equipped with a crystal ball, but according to Keeping Matters Current, home prices are expected to appreciate, on average, by 3.6% per year over the next five years– and to grow by 18.2% cumulatively, according to Pulsenomics’ most recent Home Price Expectation Survey. But that and infographic below reflect national figures, not coastal San Diego’s higher priced market. So, what does this mean for homeowners and their equity position in general? As an example, let’s assume a young couple purchased and closed on a $250,000 home this January (or use a multiplier for North County prices). 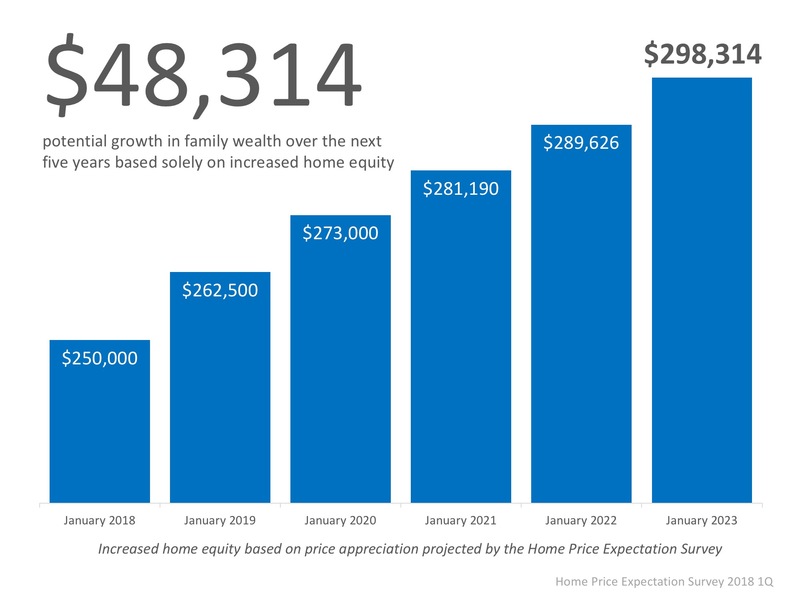 If we only look at the projected increase in the price of that home, how much equity will homeowners accrue over the next 5 years? Since real estate experts predict that home prices will increase by 5.0% in 2018, young homeowners will have gained $12,500 (or even more in San Diego) in equity in just one year. 3. Unemployment: San Diego’s unemployment figures remain low and wages are finally starting to inflate. 4. Consumer Sentiment: The stock market is volatile (have you noticed?) and home prices in the coastal (blue chip) areas of San Diego remain very strong, and prices of certain commodities (oil) are rising as the worldwide economy improves. 5. Home Builder Sentiment: Home builders are optimistic, but are keeping their eyes on lumber costs, rising labor costs–and the shrinking supply of building sites. 6. NOD’s and Trustee Deeds: San Diego short sales and foreclosures are down to a dribble, which hurts the fix-and-flippers. With San Diego home prices so high, most stressed homeowners can now get out whole and move with money in their pockets. 7. Affordability: The San Diego real estate market and the stock market have a common thread.. They have both been doing well, but some believe the stock market may have been over-stimulated. The same might hold true for San Diego home values. It feels good now, but there’s always the possibility of Black Swans and negative consequences. Not only is homeownership in San Diego something to be proud of, but it also offers you and your family the ability to build equity you can borrow against in the future–or reap the benefits later in life. If you are ready and willing to buy, find out if you are able to today–and if your are thinking of selling your San Diego home and locking in profits, give Roberta or Scott Murphy a call at 760-402-9101 or 760-613-6190.